Posted on October 27, 2007 by Ching under Life. I have no idea why people hate living in Wichita so much. The cost of living is reasonable, there are plenty of things to do, and probably best of all we’re not suffering the housing crisis that seems to be going on everywhere else. Why would you want to live anywhere else? Brian and I have often thought of moving but would never really seriously consider it. Besides not being able to afford to live in another state because of the high cost of living (relative to Wichita standards), we like it here. People often complain that there’s no culture and nothing to do. On the contrary, there’s plenty to do. You just need to open your eyes. Brian and I went to do the art crawl, Final Fridays, last night. As the name suggests, the event happens monthly on the final Friday of each month. 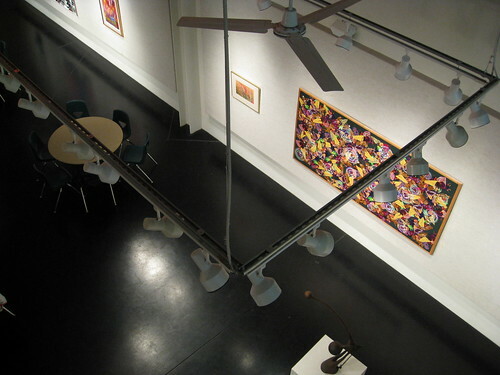 Several galleries and studios participate. In the Commerce strip, you can check out WSU Shiftspace, Fiber Studio, Diver Studios, Go Away Garage, and Fisch Haus. In the Delano district, you’ll find Bungalow 26, Academy of Fine Art, and The Art Syndicate. There’s also the Bruce Ward Gallery on Douglas; City Arts, Mead St. Gallery, and Tangent Lab in Old Town; and the Wichita Art Museum. Besides the art galleries there’s Old Cowtown Museum, Exploration Place, Botanica, Sedgwick County Zoo, Sedgwick County Park, Museum of World Treasures, etc. We also have some of the best movie theaters in the nation. As disappointed as we have been with the customer service at Warren Theaters, I have to concede that Mr. Warren knows his stuff. The 13th Avenue Warren is very, very nice. Granted, we do try to get away from time to time. We will have long trips and day trips, but I couldn’t imagine living anywhere else. Wichita is our home. We really like it here. Posted on October 27, 2007 by Ching under Flickr, Sponsored Post. Wichita has a city-wide art crawl on every last Friday of the month. The event is called Final Fridays and is a lot of fun. Brian and I went last night with a couple of friends from work. It was interesting, but by the end of the evening my feet were killing me. While it’s nice to actually socialize and hobnob with the artsy fartsy types, sometimes it’s actually better to browse art galleries from the comfort of your own home sans all the walking, studios that smell like BO, strangely dressed teens, and talkative hippies (Mike got on Darcy for the last one, LOL). Park West Art Gallery has a brilliant collection of art. They’re actually having a sale right now so you can save up to 45% on more than 400 works of art. Not bad. Save yourself the walking and check out their collection. Posted on October 24, 2007 by Brian under News. I have been reading in the news that China, Japan and soon India are all sending probes into space to be the first to colonize the Moon. China wants to build a space defense platform on the Moon that will be what they believe there shining monument in there Military. Personally I think they watched Austin Powers too much and think that if they put a weapons platform on the moon that the other countries will bow before there superiority. I think they have not thought this through. It’s going to take years of effort and trillions of dollars (that they do not have) to build a defense platform on the moon. Not to mention that if they choose to launch something offensively, it will take 3 days or more for it to reach earth, with all the orbital satellite’s that detect foreign object heading toward earth it will be like watching a bug hit your window in slow motion. Japan has also launched a probe to the moon. This one is a little more ambitious. They are looking to map the surface and plan on future exploration of the moon for “various” reasons. One such reason that is speculated is mining the planet for the known and unknown metals that are deposited there from the millions of years of meteor impacts. It was found years ago that there are large sources of Iron ore that have been impacted on the surface and covered over by years of silt. This could be a big boom to the Japanese economy if they can find an economic way to mine, refine and transport the ore to the planet. They themselves are in a financial bind as there space program has been delayed for years due to budget cuts, errors in equipment and overall failure of the program itself. This launch was supposed to happen four years ago but because of a scuttled launch then a series of costly failures it was postponed. Between China and Japan I would like to see who gets the claim on the Moon first, will this start an international incident that will force the United States to interfere and forcibly settle the possible dispute between the two countries! Or will America step up once the countries do make steps to colonize and tell them that they cant since we were technically the first one’s on the Moon and stake a claim for themselves and tax the crap out of any country that wants to turn it into a resource. Oh! Let’s not forget India. They will be heading to the moon soon as well, but it is unclear at the moment why. The only thing that I can think of is that they have to ride on the coat tales of other countries when it comes to the space race. So since China and Japan are going they have to go or they will look inferior to the rest of the other countries. I think it’s funny that these countries are just now headed to the moon and we are working towards Mars. I hope this drives the United States to pick up the pace and start the colonization of Mars and get a foot hold on the planets that can be used as resources. I told a friend of mine that we should just build a penal colony on Moon and send all of our life prisoners there. There is no chance of escape and in order to survive they would need to farm animals, veggies and what not. Its like Australia, it was originally a penal colony that was comprised of convicts, Marines and the Marines families. The convicts would have to farm there veggie, fruits and animals for consumption. They could be regulated and even mine the interior for minerals and metals that would be used to sustain the facility. They would learn a trade expand the facility and in the end have the ability to prove there worth as a valued member of society. Something that they can not do here on Earth. On Earth they just sit in a cell and wait to die. I think I will draw up some pictures of my idea for a Lunar Penal Colony and see what everyone thinks. Stay tuned for more on this. Posted on October 21, 2007 by Ching under Life, Wishlist. Holy cow! This $1.4 million dollar house is probably the highlight of our 2007 fall parade of homes adventure. You haven’t seen amazing until you’ve seen this house. It was breathtaking! Let’s start with the fountain in the front patio/courtyard area. The front courtyard (I don’t want to call it a front porch because it is so much more than that in size and design, specially with the beautiful fountain) is accessible from the kitchen and the formal dining and the front door. On a nice summer day, you could easily just leave all of the French doors open when you’re entertaining. When you walk in, you are greated by this really expansive great room, “great” is an understatement. You could fit our entire house in the great room. It is so big that it has two fireplaces, one on either end. The covered deck has vaulted ceiling and spans the entire width of the house. The kitchen has a huge island, bigger than Australia. All of the bedrooms have attached bathrooms. The most of the bathrooms are strategically located in between two bedrooms so they are shared. These are not accessible from the hallway because these are specifically for the bedrooms. The house has several half baths just for visitors. The shower in the master bath could literally fit half a dozen people. The huge bar in the basement boasts granite counter tops. Actually, I think all of the counters (including the bathrooms) were all solid surface, granite or marble. The walkout basement also has a fireplace. It is truly an amazing house. Brian and I felt out of place and out of our element. We are these poor schmucks who would never have set foot in such a beautiful house if it weren’t for it being part of the parade of homes. It makes me wonder what kind of people can afford to live in such homes. I don’t think I’d ever own a house like that in my lifetime, not even if we won the lottery. I love checking out these amazing houses in the parade of homes. It makes you go ooh and ahh. Sometimes it is depressing, but I find visiting parade homes more fun than depressing so Brian and I go check them out anyway. Posted on October 18, 2007 by Ching under Web. Gretchen Barretto pics via Obnoxious Queer. I’m not really one to follow Pinoy celeb chismis but when I found this on Pinoyblog.com I thought I would share. Anyway, these are likely not real. It’s supposedly some advert photo shoot or something, but the Pinoy chismosos and chismosas are having a hey day. Specially in the wake of the Gretchen Barretto and John Estrada “kissing” photo scandal. It’s amazing that Gretchen continues to be chismis fodder considering she hasn’t been in the Philippine show business for many years. I guess some people are just naturally controversial personalities.